Where do your sympathies lie? Are you a Custerphile or a Custerphobe? 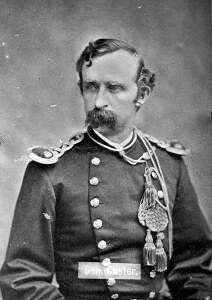 Ever since his death at age 36, people have been arguing about the tumultuous life and final days of George Armstrong Custer. Whether you view him as a tragic American military hero or as one the most notable participants in the Native American genocide, the man has proved to be one of the most divisive individuals in American history. Not surprisingly, this persistent acrimony is evident in the many books about the man, making it hard to find a balanced account. While on a recent road trip to Little Bighorn Battlefield National Monument, I spoke to one of the friendly and knowledgeable park rangers there who recommended Touched by Fire as a uniquely unbiased examination of Custer’s life. I’d like to head back to the vast plains of southeastern Montana and thank him some time. While on a similar trip to the national monument in 1991, Louise Barnett – a professor of American Studies at Rutgers University – became intrigued by the notoriety of Custer’s Last Stand and ended up writing this highly acclaimed book about the man. 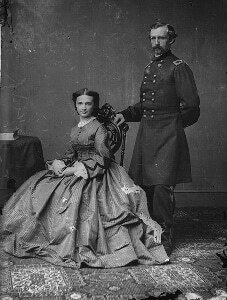 George and Libbie Custer during the Civil War. Interestingly, Barnett chooses to devote only one chapter to the actual battle on the 25th of June in 1876. Instead she starts out with all that went before, from Custer’s heroic rise to fame as a brevet major general in the Civil War to his marriage to Elizabeth “Libbie” Bacon and their subsequent decade together on the Great Plains during the Indian Wars. Following her description of the man’s famous demise – quite a challenge given that all the soldiers who witnessed it didn’t live to tell about it – the author explores why Custer’s death in an otherwise inconsequential battle evolved into such an epic and undying legend. Bolstered by extensive research and full of countless interesting details, Barnett’s storytelling makes for some great reading. Custer in 1875, whiskers in good form. Unexpectedly, much of the book centers on Libbie Custer, a remarkable individual in her own right and one of the most famous widows of all time. From her solitary pining as a newlywed bride during the horrors of the Civil War to her similar struggles in the untamed wilderness of the American West, the determined Mrs. Custer’s story is effectively used to provide a unique perspective on her husband’s life. Barnett also focuses on Libbie’s more than five decades of life after the Battle of Little Bighorn, during which she had to learn to fend for herself and find a way to earn a living. The widow’s indefatigable efforts to defend her dead husband’s honor played a key role in the creation of the Custer mythos that still inspires history buffs to this day. 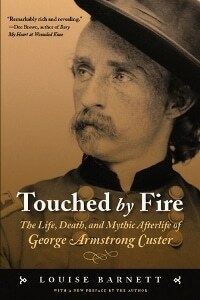 I’m no Custer expert, but I do know a good history book when I read one and Touched by Fire certainly qualifies on many levels. An intriguing and well told chronicle of two remarkable figures, the book doesn’t get unnecessarily drawn into the never-ending Custer debate. Although, Barnett doesn’t hesitate to dissect the arguments on each side, pointing out the weaknesses in some theories and elaborating on the inherent racism that has so often been part of the interpretation of that death-filled June day on the Montana plains. Highly recommended.